It’s integral we get quality shut-eye each night. Not only is sleep vital for the body to restore and rejuvenate—but how on earth are you going to concentrate the next day if you haven’t slept properly? We’ll cut straight to the chase and suggest ways that may aid you in getting a better night’s sleep. What time do you sleep? As we all have different schedules, it’d be wise to ensure you eat about three to four hours before bedtime. If you try to sleep just after eating a big meal, your stomach is going to be at work digesting all that food—and you’re not even in an upright position—which will directly affect your sleep. Moreover, indigestion comes about because of this habit. Should you eat a late dinner, if it’s a light meal it’ll affect your sleep less. It’s not to say you can’t enjoy a hearty dinner, just make sure you allow enough time for it to digest. Have you ever eaten Chinese takeaway and couldn’t fall asleep later on? Not only that, you were as thirsty as a walrus for the whole night. The culprit in this case is most likely MSG (monosodium glutamate), and too much of it. This flavor-enhancing excitotoxin can affect even the best of sleepers. MSG is found in many packaged and refined foods, and not just in your order of General Tso’s chicken—so check the ingredients of what you buy at the supermarket. MSG is also inconspicuously listed as “621” on many products. It’s best you remove MSG from your diet as much as possible, and reduce, if not avoid, fast food intake. Do you have a habit of keeping your smartphone beside you as you sleep? If you’re having trouble sleeping, perhaps it’s time to distance yourself from the phone at night. Some people stress having an electronics-free bedroom, as the EMFs (electromagnetic fields) emitted by electronic devices can have a direct impact on your sleep; that is, wireless energy waves can affect the human body’s biochemical responses. Whilst it’s difficult to avoid electrical wires in the walls, ensuring you’re not sleeping with technology is a great measure to take for a better night’s sleep. Devices such as TVs, modems, laptops, tablets, alarm clocks, lamps, electric blankets, baby monitors, and so on are all examples of items you can switch off at night. Do you want to try going without them for a week as an experiment? If you can’t part with your phone, as you may use it as an alarm—keep it at a further distance from your head. Doing this has another advantage: it forces you to get out of bed to turn it off the next morning. “One of the most simple but important reasons technology affects our sleep is cognitive stimulation,” says Mark Rosekind, PhD, and former director of the Fatigue Countermeasures Program at the NASA Ames Research Center, as reported by WebMD. Do you use the computer, phone, or watch television before sleep? Some say to avoid screens an hour before hitting the hay; however, Tanya Lewis, a writer for Business Insider, took it a step further and avoided screens the moment she knocked off work each weekday. The result? “Yes, falling asleep did get easier,” Lewis wrote. There are other things you can do in the lead up to bedtime. You could read a book, for example. As much as you can change your surrounds, nothing beats working on yourself. Avoid thinking about work-related issues before sleep, or anything that’ll cause you to become worried or stressed. If calming your mind proves too difficult, you should at least stamp out negative thoughts—make a conscious effort to focus on the positive. Read the quotes from renowned people. Doing so may have a surprisingly profound effect on your world view and calm you down from within. Here are some names of some notable people to get you started: Socrates, Nikola Tesla, Milarepa, Leonardo da Vinci, Confucius, Mark Twain, Mahatma Gandhi. 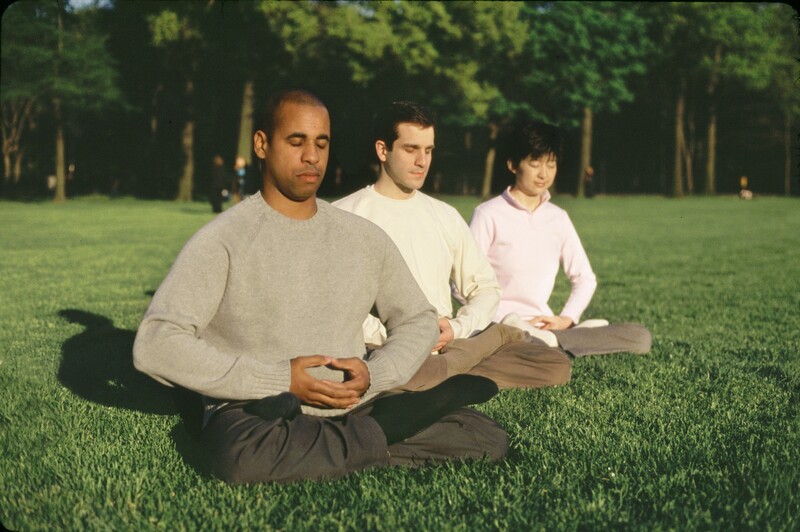 Falun Gong, also called Falun Dafa, has deep historical roots, and is a popular form of “qigong” that’s centered on the three principles of “Truthfulness-Compassion-Forbearance.” This spiritual practice has its exercise-meditation component, which has proven extremely effective in improving people’s health, vitality, and even sleep. Taiwanese psychiatrist Li Zhengxun used to suffer from insomnia and multiple ailments. After practicing Falun Gong’s meditation and reading the practice’s main text, he was finally able to sleep without sleeping pills. There are multiple other factors that could disturb sleep, such as the type of mattress you’re sleeping on, caffeine intake, food or drink that contains artificial colors or preservatives, and so on. Still, what’s most conducive to a better night’s sleep is to work on your heart. We can get so caught up in our busy lives that we forget this most basic point. “Most persons are so absorbed in the contemplation of the outside world that they are wholly oblivious to what is passing on within themselves.”—Nikola Tesla.